Back in the good bad old days, when barbers doubled as dentists, factory machinery regularly mangled workers, and there was no social safety net or central air conditioning, households regularly hired children as chimney sweeps. Boys as young as four were forced to shimmy up chimneys only 18 inches wide, knocking soot overhead loose with a brush—soot that would fall all over them and cause all manner of health problems. Happily, times have changed, and you can either hire adult chimney sweeps or do the job yourself. It's not difficult, it doesn't require crawling up a chimney, and it doesn't require outrageously expensive equipment! Maintaining a clean fireplace and chimney results in more efficient, safer fires. If creosote—a by-product of fires—builds up in the chimney, it may block the flue or cause corrosion and deterioration. This could force dangerous fumes from a fire back into your home. And because creosote is highly flammable, it can also result in a chimney fire. If you're using your fireplace regularly, clean the buildup inside the firebox once a week. Then, after the weather warms up and you quit making fires until next winter, give the chimney flue itself a deep cleaning. Even if you're doing the cleaning yourself, you should still have a chimney professional inspect it once a year to make sure it's functioning properly. Preparation is the first step. Cleaning a fireplace is a dirty business, and you need to take steps to control the inevitable dust that arises. Protect yourself and the room by putting down drop cloths on the floor and over nearby furniture. Don rubber gloves and a dust mask, and put on clothes you don't mind getting dirty. While they're still inside the fireplace, place the fireplace grate and fireplace irons (also known as andirons) in a plastic garbage bag; this will keep them from dropping ash everywhere. Take them outside for later cleaning. Next, sprinkle the ashes in the fireplace with coffee grounds to keep dust down, then use the fireplace shovel to scoop all the ashes into a bucket. Clean up any last bits of ash with a brush and dustpan. The next step is to scrub the floors and walls of the _firebox_—the interior of fireplace. If you have a fireplace screen, brush it from the top down. Line the floor of the fireplace with newspaper; this will serve to catch the debris that falls off the firebox walls. Clean teh walls of the firebox with a wire brush and scraper, removing the soot buildup. Next, make a paste of baking soda and water, apply it to a scrub brush, and scrub the walls to remove stains. Roll up the newspaper, taking care not to let any debris escape, and dispose of it as household trash. If the fireplace has glass doors, clean both sides with glass cleaner. Now comes the crucial step: closely inspecting the walls and chimney for debris and creosote buildup. Shine a flashlight on the walls of the firebox and chimney, inspecting them for creosote buildup, debris, and animal nests. What does creosote look like? Shiny brown or black deposits, or dry, cracking flakes. If you find creosote on either the firebox or chimney, remove it before lighting another fire (this usually only needs to be done once a year; see Cleaning the Chimney Yourself, below). 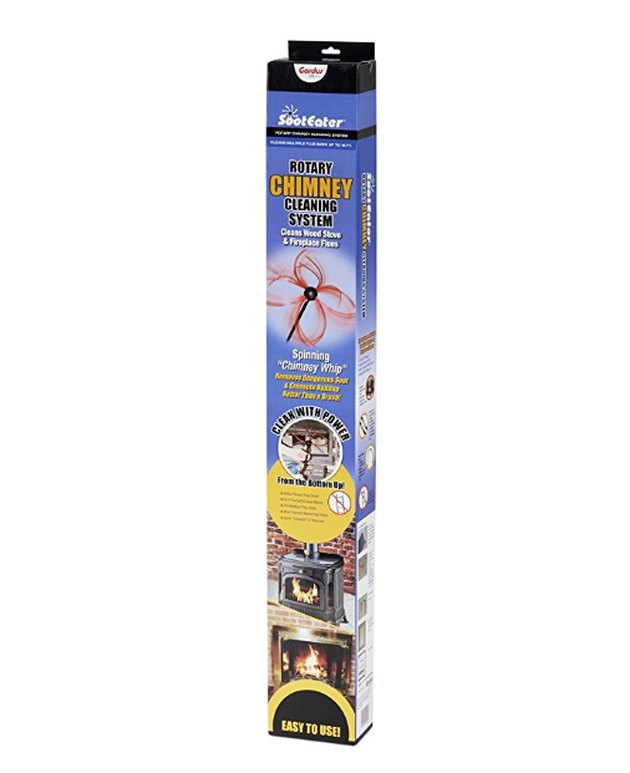 Immediately remove any nests or other debris you find inside the chimney. If there is no chimney cap, install one to prevent more animal invasions to your chimney. As a final step, take the fireplace grate and fireplace irons—still in the bag—outside to clean them. Hose them down, apply a little liquid detergent, and scrub with a wire brush. Dry them thoroughly with a paper towel, and replace them in the fireplace. Cleaning a chimney normally requires that you work on the roof in order to reach down into the chimney with extension brushes. Do this work only if you are comfortable doing so. If you are not confident or have a roof with a steep pitch, it may be best to hire a professional chimney cleaner or clean the chimney from the bottom up (see explanation below). 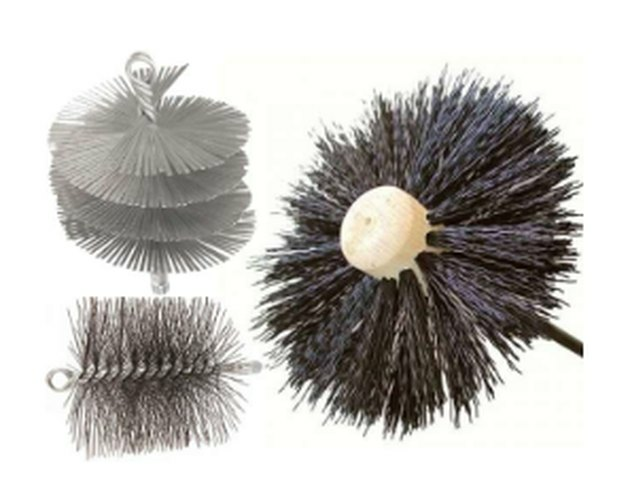 Chimney sweep brushes come in different sizes and shapes. You'll need a chimney sweep brush, and it's likely you'll have to order it online. The brushes come in round, square, and rectangular shapes, and in a variety of sizes from 5 to 14 inches. The brush diameter and shape should match the inner diameter and shape of your flue so you have a snug fit—and you'll need to go up on the roof to determine that. Just remove the chimney cap, look at the shape of the opening, and measure across its inner diameter. Your brush should be 1/4 inch larger than the opening. If the chimney is metal, choose a poly brush, which won't scratch or wear down the steel lining; for masonry, choose a wire bristle brush. You'll also need rods, which come in a variety of short lengths that you attach together. Make sure they have the same type of connection as the brush—standard threaded, button lock, or torque lock. Note that you can buy kits containing both a brush and an assortment of rods. To make sure you have enough rods, measure the height of the chimney while you're on the roof by tying a weight to one end of a rope and slowly lowering that end into the chimney. 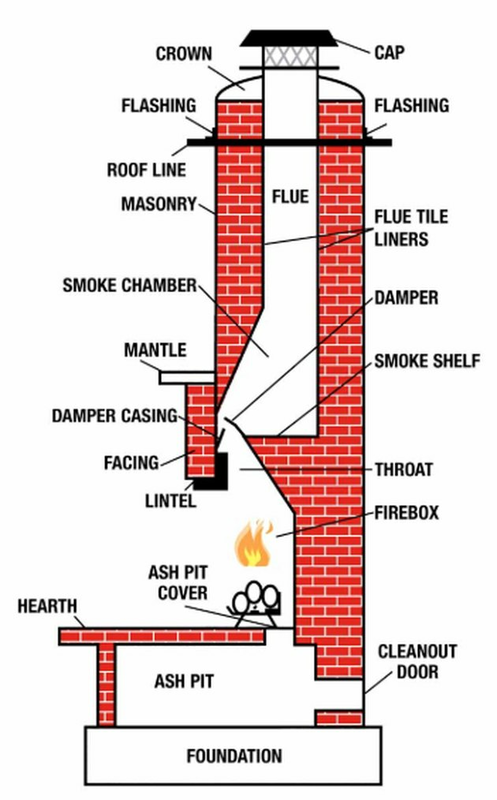 When it hits the damper, stop lowering the rope, mark the spot where it's extending from the chimney, pull it out, and measure the length between the weight and the marked spot. You'll need a little more than that distance for the combined length of joined rods. Use fiberglass rods if your chimney is straight; if the chimney has bends in it, get poly rods, which are much more flexible and able to navigate turns. Begin by sealing off the interior of the fireplace from the room so that the dust in the chimney can't escape into your house. If your fireplace has glass doors, simply close them. 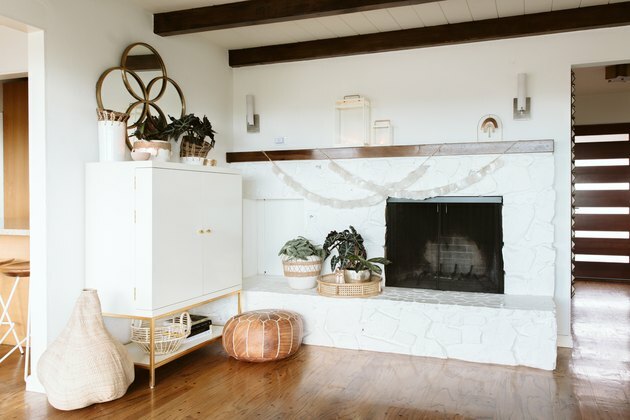 If it doesn't, place the disposable drop cloth on the hearth floor, folding it as needed to line up its edges with the back and sides of the inside of the fireplace, and letting the plastic extend out into the room. Drape the edges of the drop cloth up against the face of the fireplace, and secure them with duct tape. The idea is to completely seal off the interior of the fireplace from the room so that the dust in the chimney can't escape into your house. Protect the floor in front of the fireplace with canvas drop cloths. Now comes the step where caution and safety are extremely important: climbing onto the roof to do the cleaning. Make sure your extension ladder is long enough to safely reach the roof, and have a helper on hand to steady the ladder and offer assistance should an accident occur. Go onto the roof, bringing all the required equipment with you. Make two or more trips if necessary. Remove the cap from the chimney and set it aside. Put on the dust mask and gloves, attach one rod to the brush, and push the brush down into the flue. Scrub the chimney up and down several times, moving the rod plunger-style. At first, the brush action will feel difficult and "scratchy," but eventually you'll feel a difference, as the brush glides easily in the clean flue. Once the first section is clean, push the brush down until you run out of rod, then attach another rod section and scrub the next section of the flue several times. Work your way down the chimney, attaching additional rods as needed until the rod is as long as the chimney is tall. When finished, pull out the brush, disassembling each rod as its connection point becomes visible so that you're not maneuvering a long, unwieldy handle. Cleaning a chimney using the top down method requires climbing on the roof. If the chimney cap is covered in debris, clean it, too. It is best to take the cap down to ground level for cleaning. Place it upside down on the ground and use the chimney sweep brush to clean the section of pipe, then use the wire brush to clean the grated sides and inside the top of the cap. 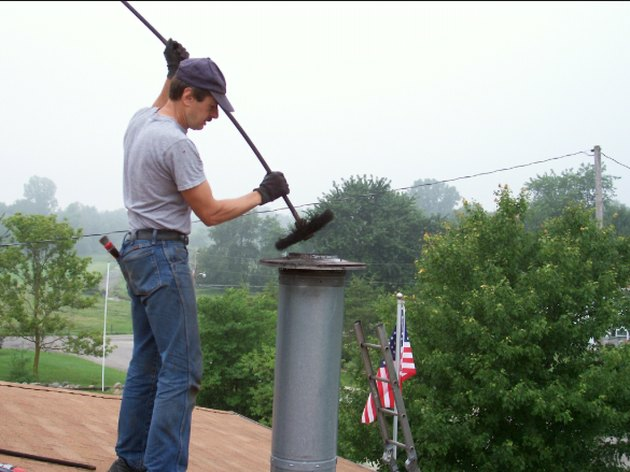 Then replace the cap on the chimney, making sure the clips are in place. The final step involves cleaning up all the debris that has been loosened by the chimney brush and deposited inside your fireplace. Return to the fireplace inside the home. If you installed a disposable drop cloth, gently untape it from the facing, then slowly and carefully place the drop cloth into the trash bag so that no ash and debris escapes into the room. Otherwise, use a fireplace shovel to remove all the debris. Remove any debris from the smoke shelf and damper door. Clean the doors with glass cleaner, if applicable. If climbing onto the roof is not your idea of fun, you can also clean your chimney from the bottom up. The trick with this method is to seal off the room to protect it from all the debris that's going to fall down the chimney, while still allowing access to the chimney. The more reliable method is to invest in a reusable canvas fireplace cover like the professionals use, but that will set you back about $115. Before duct-taping the canvas into place, place the brush behind it in the firebox, run a rod through the tubular section from the front, and screw the sections together. Then tape the edges of the cover to the walls. Cover the floor in front of the fireplace with drop cloths. Put on your dust mask and gloves, attach another rod to the section already attached to the brush, and push it up into the flue. Scrub up and down, moving the rod plunger-style, several times. Once that section is clean, push the brush up until you run out of rod, then attach another rod section and scrub that section several times. Repeat with as many additional rod sections as required to reach all the way to the top of the chimney flue. After you've finished scrubbing the chimney, remove the rods one by one by unscrewing them piece by piece while retracting the brush. Untape the fireplace cover, moving gently and slowly to avoid stirring up soot and ash, and leave it on the hearth. Uncouple the last rod from the brush and clean the brush. Set aside all equipment, and clean all the debris from the firebox. Cleaning a Chimney with a Rotary Drill Attachment. You can also purchase a kit with a whip head and flexible rods that connect to a power drill. The whip head can be trimmed to the diameter size of your chimney flue, and the manufacturer claims that the rotary action cleans up soot and creosote buildup better than a brush. The tool operates somewhat like a string weed trimmer, whipping the cord around to dislodge creosote and debris from the walls of the chimney flue. If cleaning your own chimney sounds like too much work—or work that is too messy—you can, of course, hire a professional chimney sweep. To find a qualified professional, simply do an online search for "chimney sweeping" and the name of your town, or look for a service via the National Chimney Sweep Guild or the Chimney Safety Institute of America. Rates vary, and some services offer first-time specials, so you can expect to pay between $90 and $250. Cleaning takes about an hour, and is generally done from the bottom up. Service technicians will usually wear booties to avoid dirtying your carpets and will protect the floor with drop cloths. 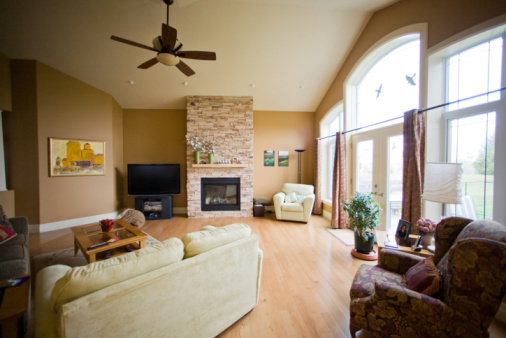 Using vacuums and either rotary cleaning devices or brushes on rods, they clean the fireplace and interior of the chimney to remove combustible deposits, then clean, inspect, and adjust the damper assembly. Finally, they perform a visual check of both the inside and the outside of the chimney, including masonry, mortar work, and crown, to look for structural problems. A deeper inspection may be done with cameras or video equipment. What Does Creosote Smell Like?